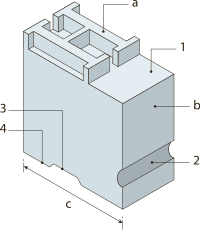 Diagram of a cast metal sort. a face, b body or shank, c point size, 1 shoulder, 2 nick, 3 groove, 4 foot. In typesetting by hand compositing, a sort or type is a piece of type representing a particular letter or symbol, cast from a matrix mold and assembled with other sorts bearing additional letters into lines of type to make up a form from which a page is printed. From the invention of movable type up to the invention of hot metal typesetting essentially all printed text was created by selecting sorts from a type case and assembling them line by line into a form used to print a page. When the form was no longer needed all of the type had to be sorted back into the correct slots in the type case in a very time-consuming process called "distributing". This sorting process led to the individual pieces being called sorts. It is often claimed to be the root of expressions such as "out of sorts" and "wrong sort", although this connection is disputed. During the hot metal typesetting era, printing equipment used matrices to cast type as needed during the typesetting process. The popular Linotype cast entire lines of text at once rather than individual sorts, while the less popular competitor Monotype still cast the sorts individually. Later, when phototypesetting replaced hot metal typesetting, sorts disappeared entirely from the mainstream printing process. Wikimedia Commons has media related to Printing letters.